Michael Degiorgio was the modern equivalent of the old-time winger. A powerful speedster, he could beat his man, centre the ball perfectly and shoot accurately. Degiorgio was born on November 15, 1962 in Pietà. A product of amateur club Ħamrun Liberty, he started his playing career in the MAFA League. His energetic running on the wing soon caught the eye of the Ħamrun Spartans committee and before long he was promoted to the senior squad. On October 13, 1979 he substituted Tonio Pace in a league game against Żebbuġ Rangers. Degiorgio was an instant success and on November 10, 1979 he had his first full league game in a 0-0 draw against Floriana. From then Degiorgio never looked back, establishing himself as an automatic choice for the Spartans with whom he won four championships and six FA Trophy winners' medals. With time, as he gained experience, he was recognised as one of the best attacking midfielders on the island. His consistent play soon earned him his first international cap - against East Germany on April 4, 1981. Malta lost 1-2 but Degiorgio's performance earned him a regular place in the National XI. By the end of his career, he had played 77 times for the country. By his own admission, Degiorgio's best game in the Malta colours was at the Luz Stadium against Portugal when the national team lost 3-2. Degiorgio not only produced an impressive display but also scored one of the goals. Among the many great games Degiorgio played for the Spartans were those against Ballymena United, of Ireland. Ħamrun won both legs 1-0 and 2-1 to reach the second round of the Cup Winners' Cup. Making his Euro debut for Ħamrun in the Champions Cup against Dundee United, of Scotland, he played in all 18 matches in Europe, 10 in the Champions Cup and eight in the Cup Winners' Cup. Degiorgio's career with the Spartans coincided with the brightest era in the history of the club. 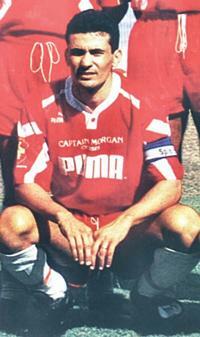 Between 1982 and 1993, the Reds won 20 major trophies and he had a hand in every one of them. In 1989-90, he was named MFA player of the year, thus becoming only the second Ħamrun player to win this prestigious award until then. The other was, of course, the great Raymond Vella. Degiorgio was also the first player to be included in the newly-established professional scheme for national team players. It was a singular honour for the young midfielder, which continued to enhance his reputation as one of the best Maltese footballers of the modern era. Degiorgio finished with an outstanding record. In a career spanning 23 years, he hardly ever missed a game. Injuries, which would have laid low many other players for a long time, hardly affected him. It was only towards the end of his career that he started to miss matches and this was rarely due to injuries. It was therefore a big surprise when in 1993 Ħamrun decided to transfer him to Naxxar Lions after 14 years of sterling service to the club. Degiorgio was disappointed but he swallowed his pride, rolled up his sleeves and set about helping his new club to gain promotion to the Premier Division. In 1996-97, he returned briefly to Ħamrun but the next year he headed back to Naxxar with whom he stayed for two more seasons. He was by now slowing down considerably but dropping back to the libero position he found a new lease of life. In 1999-00, he joined Lija Athletic in the First Division and the next season he resisted the urge to retire by joining Marsaxlokk. In 2001-02, he returned to Ħamrun. However, a successful protest against his eligibility forced him to stop after playing only one game in the Premier League. The next season he tried again but after playing half-a-dozen matches, mostly as a substitute, he finally hung up his boots. It was the end of one of the longest and most fruitful careers in the history of the game on our islands.